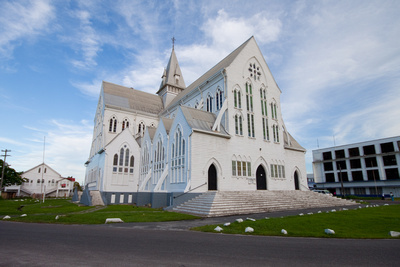 Yesterday I had mentioned the first shot I took with the Canon Rebel T1i (500D) was a photograph of St George’s Cathedral, so I thought that I’s share it here. Part of the type of photography than many of us practice is trying to establish our images as “art”, and often times I take inspiration from others, I do not COPY from them, although some may look at it that way, that’s their prerogative. I once blogged about taking Inspiration from others, and you can read that here. This shot of the St George’s Cathedral will probably never be considered “art”, but it’s a nice shot of the Cathedral, and as I wanted my first image from the T1i to be something special, I had taken inspiration from Dwayne Hackett, whom I consider to be a far better photographer than most locals that I know of. It was very humbling when I later heard from him that he also admires my own work and that of Nikhil. This shot I tested a new camera (the T1i back then) and a new lens, the Sigma 10-20 Ultra-wide Lens, and as soon as I got the shot I thought to myself, this is what I’ve been missing all along, I never took photographs on the Canon S5 after that day. I really like this one, the sky and the absence of any car or people. Great shot!